Blackjack is one of the most popular and well known casino game of skill and chance between a player and the Dealer. Microgaming casinos offer 4 Vegas Strip Blackjack games including multi-hand and new Gold Series games. Here we review the single hand original version that is played with four standard decks of 52 playing cards that are shuffled before each game / hand. The strategy is the same for all Vegas Strip variants. Vegas Strip Blackjack is an American hole card game. The Dealer checks for a Blackjack when he is dealt a 10 or an Ace. If the Dealer has a Blackjack, the game is over. If you have a Blackjack you are paid out at odds of 3:2 on your original bet. You may draw up to 9 additional cards to make a hand of eleven cards, provided the value of your hand does not exceed 21. If your hand does not exceeded 21 after receiving 11 cards, your hand automatically Stands. The object of Blackjack is to beat the Dealer by either obtaining the highest possible hand without exceeding 21, or by the Dealer's hand going bust. 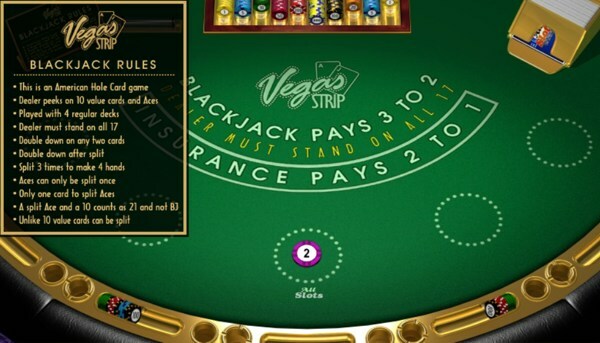 In this version of Blackjack (Vegas Strip), you can only bet one hand at a time. All face cards (Kings, Queens and Jacks) have a value of ten (10) and the Aces can have a value of one or eleven. Please refer to our basic blackjack rules to learn more about the game terms and general rules. You can Split 2 cards that have the same denomination, such as a Queen and a 10, or two Eights. Your hand is divided into 2 separate hands and a bet equal to your original bet amount is placed on the second hand. If you Split a pair of Aces and then draw a card with a value of 10, this is not Blackjack, just a hand with a value of 21. You can Split up to 3 times per game (get up to 4 hands). If you Split Aces, each Ace is dealt one card, and the hands automatically Stand. Game Statistics (Stats button) enable you to view information about your current game session: the number of hands played per hour, the winning combinations, the percentage of winning combinations, highest wins and more info. Insurance is not recommended in Vegas Strip BJ version. When the dealer is dealt an Ace you are allowed to make an insurance bet. The Insurance bet costs half your original bet. If the dealer gets Blackjack, you are paid at 2:1 but lose your original bet. If the dealer does not get Blackjack you lose your insurance bet i.e. you get just 1/2 of your original bet. If you follow the strategy shown below you can decrease the house edge up to 0.36% or even less with card counting. The strategy is printed as table with the Dealer's up card the first row and player's 2-card combination the second column. The letters in the table tell you what to do (Hit, Stand, Double Down or Split) depending on the different combinations of dealer's and player's hands. Optimal Vegas Strip Blackjack strategy tables for Microgaming's rules are shown above for hard totals, soft totals, and pairs along with a legend. Today most of the Microgaming casinos offers over 40 different versions of Blackjack including: Vegas Strip, Vegas Single Deck, Vegas Downtown, Atlantic City Blackjack, European, Spanish 21, Multi-Hand, Double Exposure and Triple 7's progressive blackjack plus multi-hand and Gold Series versions of the popular games (see the complete list on the Microgaming bar menu).